Sitting uncomfortably on a plush sofa, I looked around and scanned everyone present at the gathering. They all smiled at me, and I immediately felt welcomed. Small conversation followed, most of it in Gujarati which I follow well now. I was asked a few polite questions, also asked if I wanted a cup of coffee, an offer I was highly tempted to accept but declined nevertheless. No one was even drinking water, and I knew there was dinner after the session. Mrs. Chinubhai coordinated the prayers and explained the next course of events for the evening, perhaps more for my benefit. The Bahá'í prayer sessions usually take place in someone's house, they actually have very few places of worship so home usually turns into a temple. Prayers usually start with a few people (you can also suggest your name) who sing a few songs, while other who know the lyrics can also join in. We prayed in three languages that day - Gujarati, English and Hindi, and this changes with wherever you are in the world. There are a set of books with prayers and Bahá'u'lláh's sayings, and different people read different sections from them. I was the new one and was given a huge section in English to read (about peace, war, destruction, humanity etc.). Usually afraid of any public reading, I faltered at regular intervals. I liked what I read, but was highly embarrassed with how. The prayers are usually followed by dinner with the host and discussions, and often a cup of coffee before its time to say good bye. Its a time to socialize, and catch up on each others lives, and maybe offer help/ advice to some. I was, of course, experimenting with the faith that evening. From the time Roshni had joined office, I was intrigued as I had never ever met anyone who followed the faith. Needless to say, this wasn't the last time I attend the prayer, and soon became a regular with them. But why? I really don't know as yet, there is something very pure and clean about the prayers, something completely unpretentious. No one expects anything from you, and even as a silent observer there is much to absorb. Bahá'í faith started as a movement in the 19th Century Persia (modern day Iran) but its members were soon persecuted and had to flee to neighboring countries. The faith, however, survived all persecution and currently there are believed to be five to six million of them in about 200 countries across the globe. Read more about the faith here. India is one the countries where there are many followers, and can practice their beliefs without persecution. Unfortunately, in Iran, the country of their origin, they are still not recognized as a faith and have to live and pray in the hiding. In India its most famous landmark is the Bahá'í Temple in New Delhi. I've been there as a kid, and all I remember now is silence (which was an unusual feeling for me a kid back then). I am sure a visit again would be more fruitful because I know so much more about the faith now. 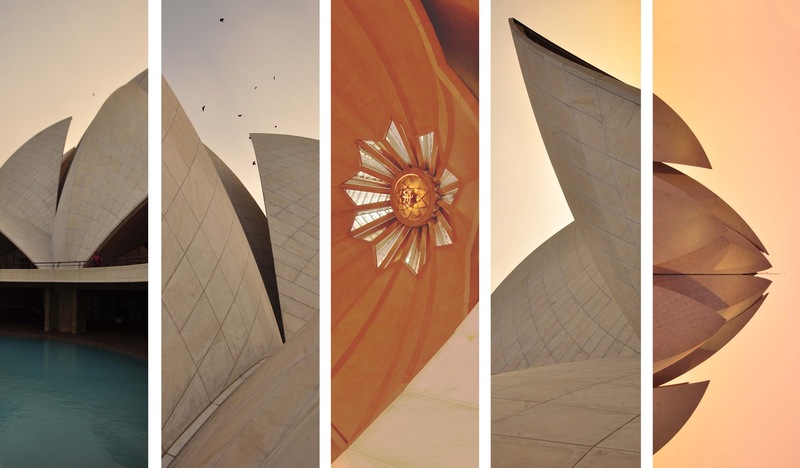 Above is a collage of some of the images Roshni took of the temple recently. You can find more of her photography work here. This is very interesting. I was not aware of it. Sounds so relaxing and soul searching exercise to me. Thanks for sharing! I wanted to learn Gujrati at a point of time. Badly so! I find it too sweet in its sound. I remember the silence pretty profoundly too..
And coming to think of it, I didn't know so much about the faith .. Thanks for the info! Last december I had visited this place..Beautiful na and really LOTUS like. And Bahai inspired me a lot too. How these foreigners where folding thr hands and helping the crowd move on and sit silently inside tht majestic place..
@RedHanded: I think it time for me to visit the place once again...been so many years! @Chintan: Now I am very very curious...batao batao! "here is something very pure and clean about the prayers, something completely unpretentious. No one expects anything from you, and even as a silent observer there is much to absorb." This flows in my veins..too intriguing, needless to say. Chintan recommended your blog and I spent a lot of time on both your blogs today.Loved the experience. Yeah, it is absolutely awesome :) I have been there last year. The inner sanctum of the Lotus temple is the most quite and serene place I have ever been to. The video footage of the temple's construction which they show in small theatre is very informative. Nice piece. I like it. hey, have u got the chance to go through Garcia's Memories of my melancholic whores. This post had a very calming feel to it and no, I didn't know anything about Bahai religion. It seems so simple and practical and yet so intricate and humble at the same time. Its hard to assign these adjectives to 'religion', you know? @Kunal: Absolutely, that's the beauty of the place...absolute calm! Hi SIdhhartha, after reading your post, I am interested in Baha'i faith, I know that there's a baha'i centre in Ahmedabad somewhere but never have been there, even I searched internet but could not get solid results, it would be great if you could please share details on how to be a part of their prayer sessions here in Ahmedabad! I would love to make some frames in my living room! I am really sorry Carla...this is all I have now. The big sized original is lost with the hard disk!